The Univention Corporate Server (or short UCS) provides a very easy way for admins to get started with Kopano. Through the Univention App Center admins can install “apps” such as “Kopano Core” (our groupware server), “Kopano WebApp (groupware client)” and “Z-Push (for ActiveSync compatibility) for Kopano” and these apps will automatically take care of configuring all services in the background and provide an integration into the UCS management UI, from where the admin can easily create and modify users. Additionally, these apps make it easy for the admin to perform frictionless upgrades since the app itself can take care of the required configuration and dependency updates. One of the benefits of having a Kopano subscription is that it gives you access to our official releases. Because of this, we cannot upload every Kopano release to the Univention App Center, where Kopano can be downloaded for free. Luckily there is an easy (and of course supported) way to still benefit from our updates on UCS. 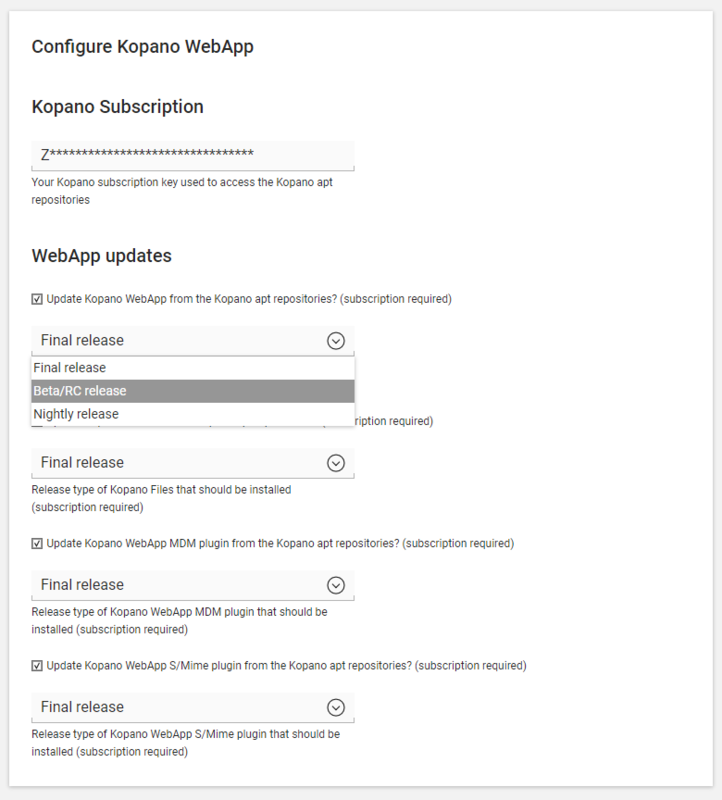 With the next refresh of the UCS package sources the admin is offered to update to the most recent Kopano release available from our repository. The last thing that is important to mention in relation to this is that this will not change the version of the installed app, but only the version of the installed Kopano packages. E.g. updating the “8.6.8” app with our repository to “8.6.9” will still show “8.6.8” in the App Center, but the actually used version will be “8.6.9”. Enabling our repositories also has no influence on app updates offered by the App Center. These updates bundle the integration package and should still be installed. PS: have you enabled these repositories but do not see package updates? Early versions of the repo integration used a different default user name. Just execute <univention-config-registry set kopano/repo/username='serial' once to store the proper username.